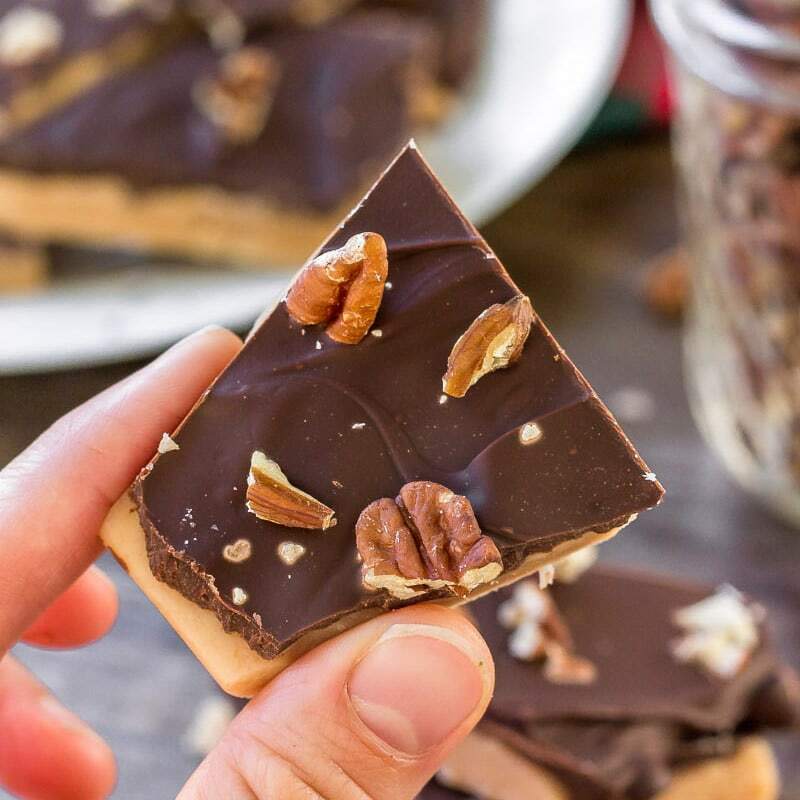 This easy toffee recipe is the perfect homemade treat. 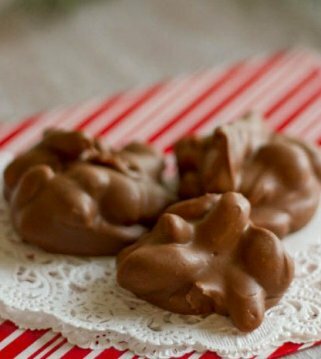 With sweet and buttery toffee, creamy chocolate and crunchy pecans, it’s perfect for the holidays and for gifting too! 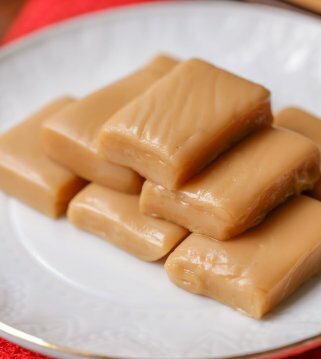 Toffee is a hard candy usually made by boiling together sugar and butter. It is often topped with chocolate and is referred to as English toffee candy. 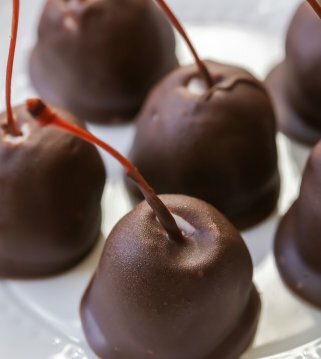 It’s a popular recipe to make for holidays and is one we love to gift too! 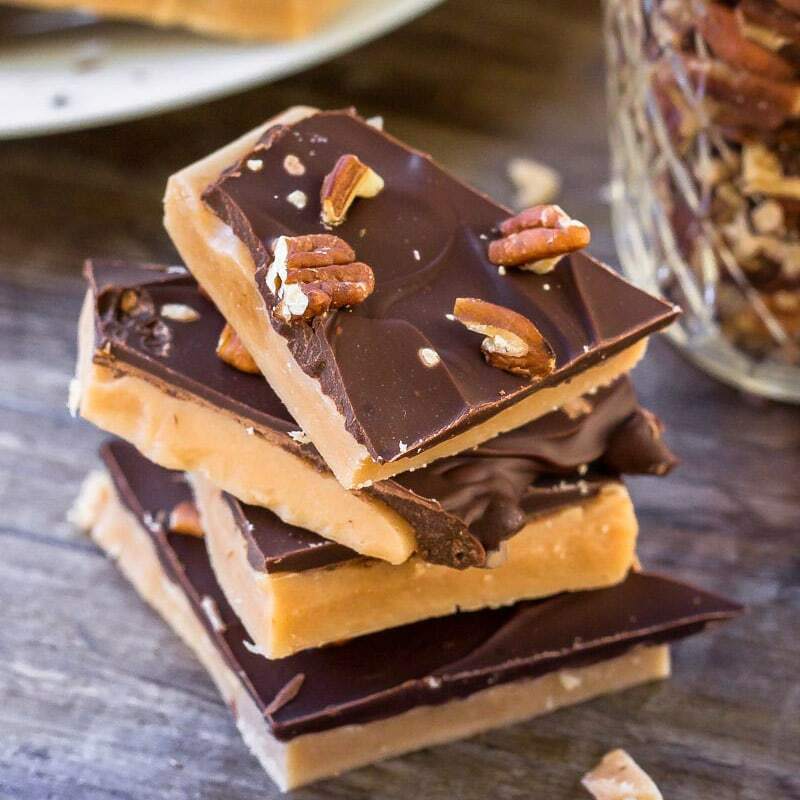 Have you ever made homemade toffee? 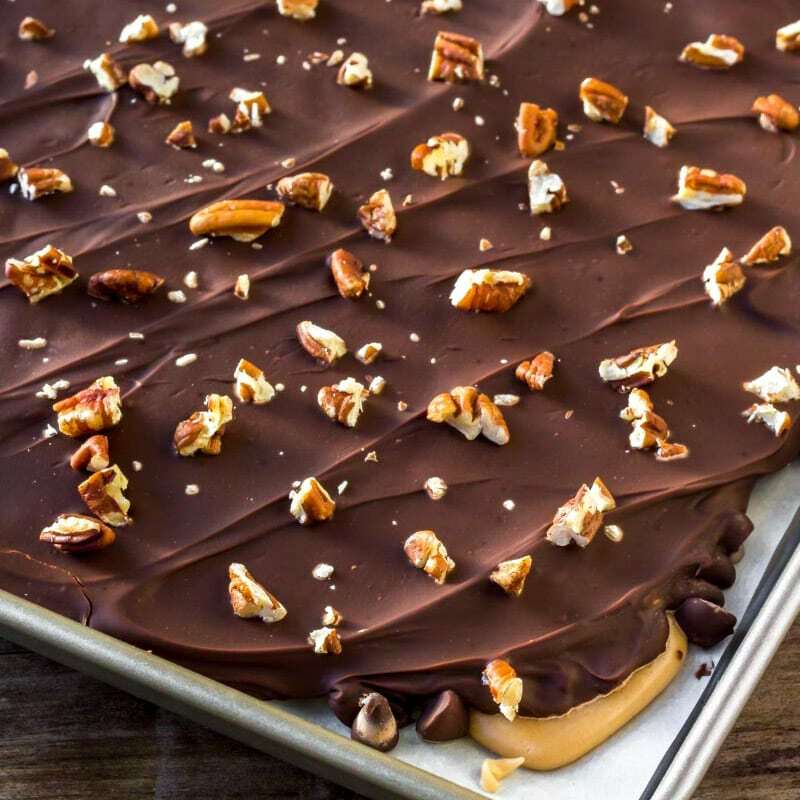 I always like to make a big batch over the holidays (we even have a Pretzel Toffee we love to make too!) It’s perfect for entertaining, wrapping presents, or gifting to neighbors and friends. And no one can resist a piece of sweet, buttery, crunchy toffee. Making toffee is actually very easy. There are only a few ingredients, and it’s pretty straightforward. However, because the toffee mixture gets very hot you need to be careful. To get started we melt together butter, sugar, corn syrup, vanilla extract and a little salt. After everything is melted together bring it to a boil while whisking constantly. Boil the mixture for 10-15 minutes until it reaches the 290F degrees on your candy thermometer – which is the “hard crack” stage. It’ll be amber in color. Then immediately pour the mixture onto a lined 12×17 inch cookie sheet. It’s important to place the cookie sheet on a wire cooling rack first, otherwise the heat can transfer onto your countertop and potentially make a burn mark depending on what your counters are made out of. Wait about 1-2 minutes, then sprinkle chocolate chips overtop. The chocolate will start to melt, then spread it smooth with a knife or spatula. I like to use the same kind of flat knife that I use for frosting a cake. Then sprinkle the top with chopped pecans. When it’s fully hardened you can cut/break it in pieces, and you’re ready to go. Make sure to use real butter – margarine won’t work for this recipe. Use a large, heavy bottom saucepan. If the bottom of your saucepan is too thin, the toffee can burn. Whisk the mixture constantly as it boils. I recommend using a candy thermometer to take the guess work out of knowing when the toffee is done boiling. If you don’t have one it’ll boil for 10-15 minutes after everything is done melting together and be an amber/caramel color. Feel free to use milk, semi-sweet, or dark chocolate on top. Instead of chopped pecans, you can use chopped almonds or holiday sprinkles on top. 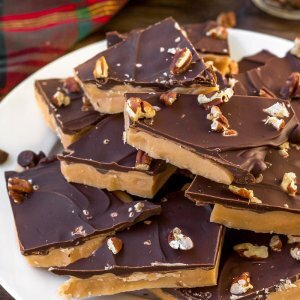 I love making this toffee recipe over the holidays. It’s sweet, buttery and completely addictive. You can wrap it in festive cellophane bags and give it as gifts, or enjoy it yourself. 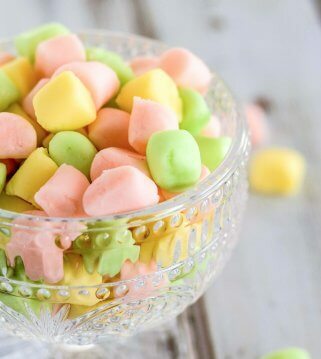 Either way – it’s the perfect homemade candy to add to your baking repertoire. 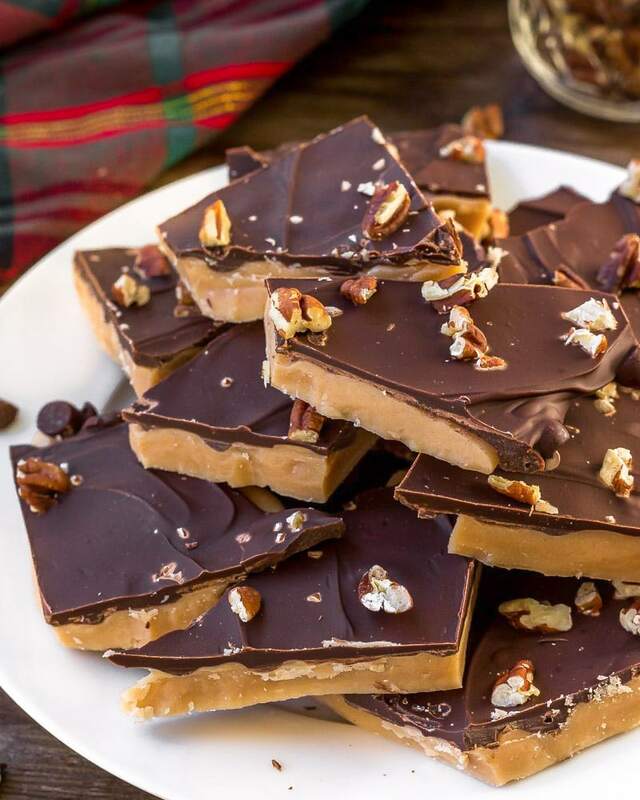 This easy toffee recipe is the perfect homemade candy. 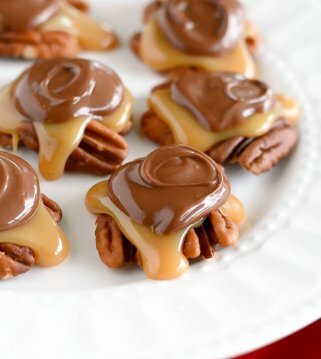 With sweet and buttery toffee, creamy chocolate and crunchy pecans. Line a jelly roll pan with parchment paper. Place the pan on a wire cooling rack. Add the butter, sugar, corn syrup, vanilla extract and salt to a large heavy-bottom saucepan. Clamp a candy thermometer to the saucepan. Melt everything together over medium heat until smooth. Bring the mixture to a boil while whisking constantly. Continue whisking the mixture as it boils until it reaches 290F or the "hard crack" stage. This will take about 10-15 minutes and the mixture will be amber/caramel in color. Immediately pour the mixture into the lined jelly roll pan. Let sit for 1-2 minutes, then sprinkle the chocolate chips on top. After 1 more minute spread the chocolate smooth and sprinkle the chopped pecans on top. Harden at room temperature for 2hours, then cut into pieces with a thick sharp knife. Love this recipe! 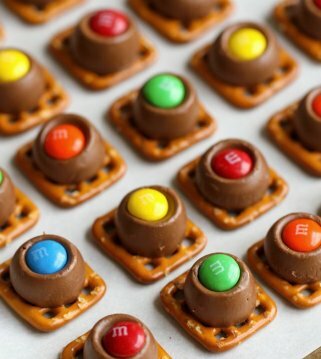 This is in my candy gift list! Woohoo!!! Glad it made it to the list 🙂 Thank you!